Miss Caroline Elizabeth is almost here, and I really wanted something fun to give visitors at the hospital and at home when I had the baby–something small & simple, and with her name on it. We’ve all seen Hershey Kiss stickers for every season & holiday, and I’ve always loved them, so I thought designing one as a tiny baby announcement would be PERFECT! I’m including a tutorial today that shows you how to make your own stickers–for any name you like. The idea came to me when I was in Michael’s, and saw bags of Hershey kisses that said “It’s a Girl” and “It’s a Boy”. I immediately fell in love with them, and knew adding her name to the bottom was exactly what I was looking for. If you can’t find them at your local Michael’s store, just google them–lots of links come up where you can buy them online…or use regular kisses! Usually I use Photoshop to create something like this, but I know there are many of you who don’t use or have Photoshop, and I wanted everyone to be able to make these, and personalize them. So…I created the basic circles for you in three colors–pink, blue, and yellow–and I’m going to show you how you can make your own without Photoshop. And it’s EASY–you can totally do it!!! Download one or all of the following circles (jpg files), and save them to a folder on your hard drive. Go to www.picmonkey.com. It’s a site where you can edit your photos and create collages–for free! There are some options that they offer only for their subscribers, but there is a lot you can do just using the free stuff. When you get there, click on “edit a photo”, and you’ll be able to browse and open the circle jpg file you just saved. UPDATE: If you want a different color, it’s easy to do! Go to picmonkey.com, click on “edit”, then upload this blank image after saving it to your computer. When it opens, it will be a square shape, and look like a gray checkerboard. That means it’s a transparent image. Click on the butterfly icon on the left (overlays), and then on “geometric”. Select the circle. It will be black, and small. Click on the circle, and drag the edges to make it bigger, to fill the square. 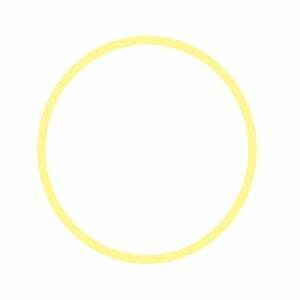 Change the color to whatever you want the outline of your circle to be. 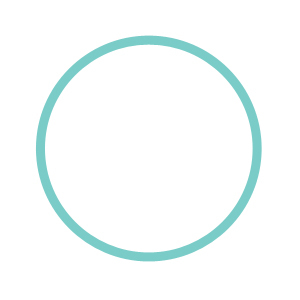 Open another circle, make it white, and make it bigger–all the way to edges of the colored circle, leaving as much of a border (thick circle line) as you want! Then you can proceed with the rest of the steps. Let me know if you have any questions! This is what your page will look like once you’ve opened your file. On the far left, you’ll see a bunch of options like crop, rotate, resize, et. Those will be for photos you want to edit. To the left of those, are several icons that run down the side of the page. If you click on the “P”, it will open up the text options, which is what you want to do first. Now you can select the font(s) you want to use, then click on “add text”. A box will pop up (the one on the screen on the right), where you can also select color, and change the size to fit in your circle. I did this twice–one for the first name and one for the middle name. When you’re finished with your text. you’re ready to add a fun shape or embellishment. The icon right underneath the P is a cluster of three small shapes, and when you hover over it, it says “overlay”, as you can see on this screenshot. Click on it, and it will open a ton of options for embellishments. I chose the hearts options, and as you can see, there are quite a few to choose from! Select the embellishment you want, and a small box pops up (on the right of my screen) that gives you options for colors. All done!! At the top of the screen, it gives you the option to save–go ahead and save it to the file of your choice. Now you’re ready to create a whole sheet of the cuties–so you can print and punch! Open up a new Word document (or compatible–these instructions for for Word), and choose “Insert”, then “Picture”. You’ll be able to browse for the circle image you just created, and insert it into Word. I created the circle to be the right size, so you shouldn’t have to re-size it—it should be 3/4 inch. It for some reason it’s not, go ahead and re-size it. Copy the image you just inserted, then paste it (Ctrl V) over and over, until it fills the page. Print your file onto a white full sheet label. Use a 3/4 inch circle punch to punch out the circles, or cut them out with scissors. Stick a circle onto the bottom of each Hershey kiss! Aren’t they CUTE???? I LOVE it!!! 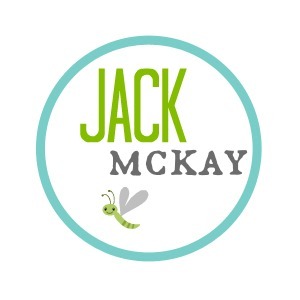 These would also be really cute labels for a million other things…just re-size the circles in Word to whatever size you like, print, and cut! 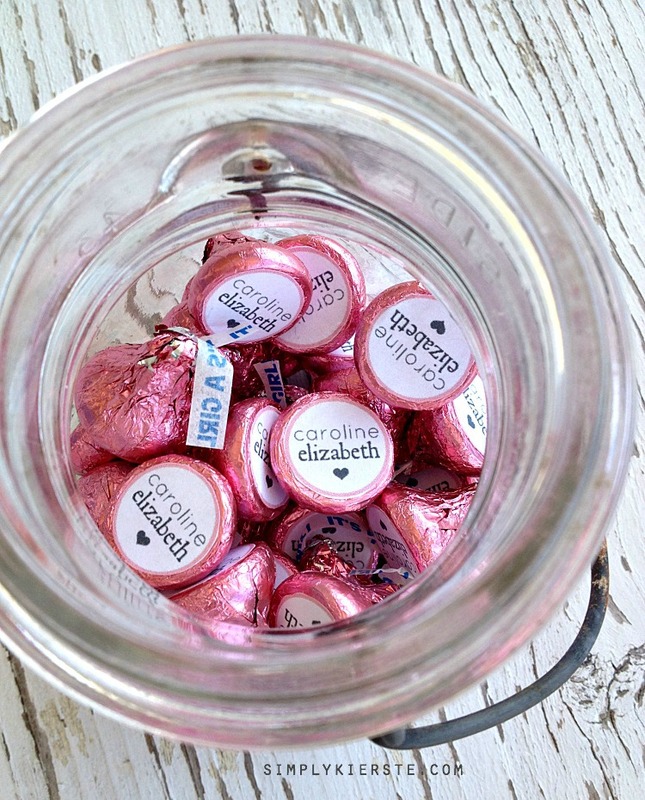 Easy personalized Hersey Kiss stickers…birthday parties, baby showers, wedding showers or receptions, the sky’s the limit!! So stinken cute!! 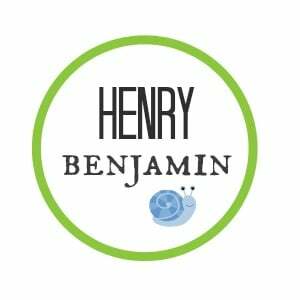 We’re due in July, pinning away for future reference! Oh, my goodness!!! One more thing to add to my fun and crazy to-do list for the next 4 weeks. LOL! Thanks for this ADORABLE idea!!! I LOVE IT! My ‘babies’ are now 15 and 12 and if I were ‘to go there’ again, I would so use this idea but those kisses are really too cute to take the wrapper off of and eat….so sweet…God Bless You as you await the arrival of your little one…. You are going to die laughing…..I bought two bags so I could get this checked off my list… (we’re having a girl!, after 3 boys) and guess how many pinks there were in the first bag???? ONE! ONE PINK KISS!!! And my circle punch is too big….so…..off to figure something else out. LOL! What??? One pink kiss in the whole bag of It’s a Girl Hershey Kisses? That is SO CRAZY! I would totally take them back! My circle punch was also too big, so I cut them out with scissors-it took less than an hour to do the whole thing, even doing it that way. Hi Keirste, LOVE LOVE LOVE you!! Great tutorial, just wanted to let you know Staples sells circle labels in 3/4 size so you can print right on them, peel and stick!! <3 Thanks for you amazing blog!! Hi! These are so cute and were also very easy to do! Thanks for the tutorial! I was wondering if you would consider putting other color circles up also for other holidays? Basic black, green, red…etc.? 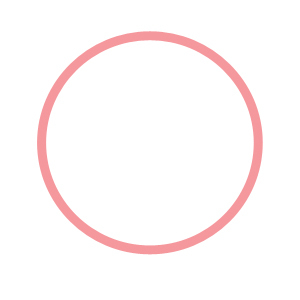 Or is there an easy way to create the circle myself? Thanks for sharing!! I made hello kitty sticker with your tutorial and they were lovely! ah!! this was awesome! thank you! I cannot figure this out for some reason :( I created the image just fine, but didn’t know I was supposed to size it first before saving it. The resize option doesn’t allow for 3/4 or .375 as the size = it’s only in pixels? I had already inserted the save image into word but when I resized it to .375 it was so very tiny? I’m not sure what I’m doing wrong? HELP! Hi, Lisa! When you click on the text, the text box should pop up, and there’s a place where it says “size”, and a slider button that you can move back and forth to change the size. Or, you can type in a number if you prefer. Let me know if that works!! Thank you!!!! This is THE BEST, most comprehensive tutorial out there.. Saved me time and money. First off I have to say this tutorial is amazing! I’m helping my sister with her wedding favors and this is a life savor:) I have a question though. I’m pretty sure I messed up the sizing when trying to fit a good amount on a single sheet of paper. What size should I make them while in Word to work with the 3/4″? It says they’re at 1.1 right now and it shows seven across like in your photo. I’m not very savvy when it comes to crafting so I hope I’m not royally screwing it up!!! Hello there! When you say “1.1” is that inches? What are you looking at? 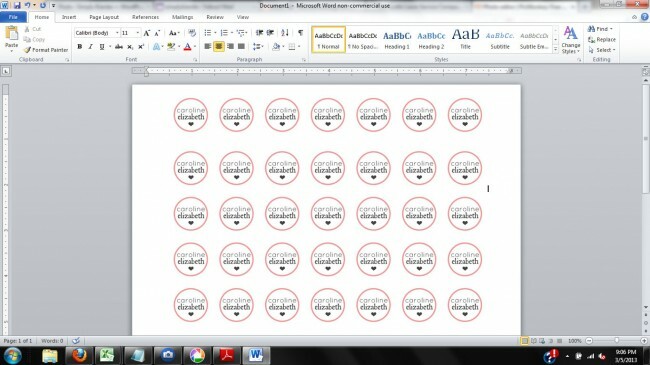 I look at the grid to the left or top of my document, which is in inches. When I do the first one, I re-size it to be 3/4 of an inch, and look at the inch mark at the top as a marker. Another easy way to do it is create a document and format it to be 3 columns, and then change the margins until the open space of the column is 3/4 of an inch. Then when you insert the photo it will automatically fit into that space. Lastly, another way you can make sure it’s 3/4 of an inch is to save it that way when you create it. 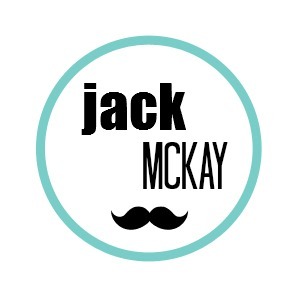 Are you using picmonkey? You can resize or crop the image to be a specific size, and if you save it to be that size, when you insert it into Word, it will maintain that size. Did I help? Or answer your question? If not, please let me know!! Picmonkey won’t let me save anymore. Have to pay for subscription! What a bummer. I’m crafty once every few years. Not enough to warrant paying. Any other similar sites out there that you know of? Darn!! Try Ribbet, Canva, Pixlr, Fotor, Picfull, BeFunky…hopefully one of these will work for you!